Allow us to start with a direct quote from Giulio Meotti’s article titled, “Europe has chosen disgrace” where he stated referring to Europe as a whole, “It has no interest in Israel. Indeed, I will say more: in their intimate thoughts, in their “mental deal”, most Europeans think that Israel, the country most at risk from a nuclearized Iran, is a burden, and that the Middle East would be more peaceful without a Jewish State.” At this point, we need to place a disclaimer, we really do not hate France and we are using someone else’s material and we do have to agree that France did provide the largest target of recent history of anti-Israel bias. Quoting from deeper in Giulio Meotti’s article, we find the following list. 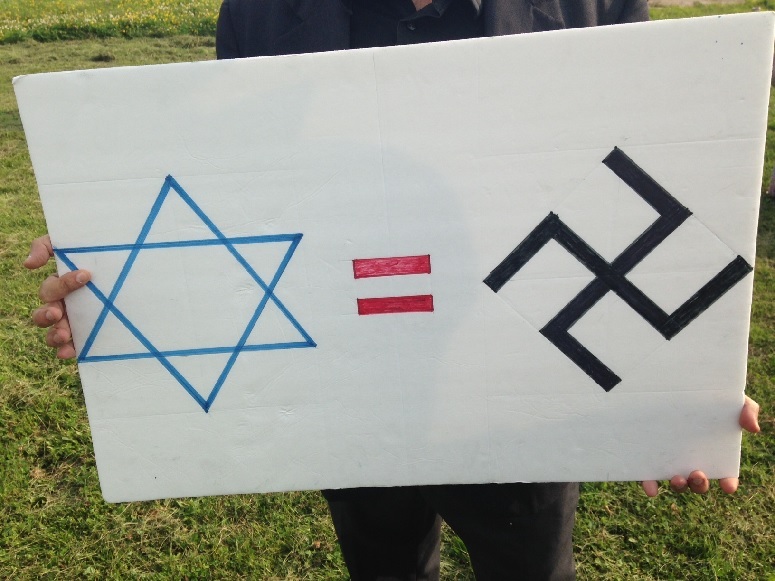 -with the Jews killed in the French suburbs and the French authorities unable to protect them. France aside, Germany, Britain and much of Europe allowing the European Union to all agree that business with Iran is far more important than siding with some American cowboy businessman and his insult to his predecessor’s efforts to reach the JCPOA (Joint Comprehensive Plan of Action) which, as far as the European powers are concerned, is a simply perfect agreement which at least delays the Iranian nuclear program. Anyways, the Iranian nuclear program is no threat to Europe, they chant “Death to America” and “Death to Israel” and not Death to Europe. Iran is doing business with the Europeans and everybody is sharing technology and making profits and getting what they desire from one another. Sure, some of the goods being exchanged could be adapted for use in the production of advanced nuclear devices, but the treaty will prevent that, so what could possibly be the harm. The Europeans are once again doing business with the greatest evil governance on the planet under the illusion that it would never target them, there is an agreement. Some places never learn from history, something which appears to be a problem the world over. At least our readers know of the foreboding warning given by writer and philosopher George Santayana, “Those who cannot learn from history are doomed to repeat it.” So, where can we go from such a beginning? There is the entirety of the mess in Syria which has much to do with Iran. Without the assistance of Iran, Bashir al-Assad would have been removed from power as the Russians would have simply reached an agreement with one of the dissident groups, be they Sunnis or Kurds, and in return for retaining their airstrip and naval ports, they would have allowed one to form a new government. Russia might have even permitted the breaking up of Syria into three separate nations allowing the Alawites to retain governance over their areas, the Druze to rule their mountainous regions, the Kurds to join with the Kurds in Iraq and form a new Kurdistan and the Sunni to have their own governance. Such an agreement would have ended the Syrian debacle and shut down its meat-grinder and made the region safer for many of the refugees and desperate people remaining within Syria to return and rebuild their homes and cities. The problem is Iran requires that they have complete control over all of Syria such that they have a route direct from Iran through Iraq and Syria to Lebanon and the Mediterranean Sea. So, it was at the insistence of Iran that all of Syria had to be brought back into their fold and under the rule of Bashir al-Assad and the Alawite Shiite Islamic power base. Russia could have lived with an agreement with the Alawites by exchanging Russian protection of their western region and coastal Syria for using the ports to service the Russian Mediterranean and Atlantic fleets and their airstrip assuring them they would also retain Damascus. Russia and the Alawites along with al-Assad would have even gained the support of the United States had they gone for such a solution. Europe would have been less taxed as the numbers of refugees would have been reduced significantly. The only country which gains by continuing the civil war in Syria is Iran and their insistence for ruling all of Syria through their puppet al-Assad so they have a direct route to the Mediterranean and to the Israeli northern border. It is the Iranians attempt to become the hegemonic power lording over the entirety of the Middle East and using this as their power base in order to spread their power even further. This is where the Europeans are making their mistaken assumptions that the Iranians have no designs on Europe in their future. The Mullahs of Iran have designs not only on Europe, but on every corner of the globe, as their eventual rule, according to the Quran, will be the entirety of the world. The only variable is how long this conquest will take and that will depend upon their first two apparent targets, Israel and the United States. Another item which should be pointed out is that Europe is anything but a monolithic culture or has any political uniformity. There is a definitive demarcation line dividing the culture and body politic within Europe and it can be drawn between the Warsaw Pact nations which emerged from the rule of the Soviet Union and the older nations of Western Europe. Where Western Europe is largely secular humanist, Eastern Europe has had a resurgence of their religious base which they had been denied for so long. Even Russia has been experiencing a resurgence of the Russian Orthodox Church. These Eastern European nations largely refused to accept the refugees from the Middle East and North Africa between a combination of refusal to permit their entrance to having military assure that they travelled straight through in the trains and left on the farthest border. Many of the refugees were passed in such manner from one Eastern European country to the next until the refugees could be dumped in Germany. This was great as far as many of the refugees were concerned as their target nations of choice were Germany and Sweden with France and Britain following initially. Soon after BREXIT, the British conservative government of Theresa May closed their border to the refugees to limit their influence and numbers. Should she be replaced by the leader of the Labour Party, Jeremy Corbyn, we can expect that decision to be reversed, to the detriment of Britain. This European split is further born witness as the Scandinavian countries are suffering from a similar malaise as the Western Europeans as they too have adopted the secular humanistic vision and socialist polity, a seeming disease with horrific consequences. There is one problem which extends throughout Europe, reproductive rates well below replacement rate. Replacement rate is defined US National Library of Medicine National Institutes of Health as, “In developed countries, replacement level fertility can be taken as requiring an average of 2.1 children per woman. 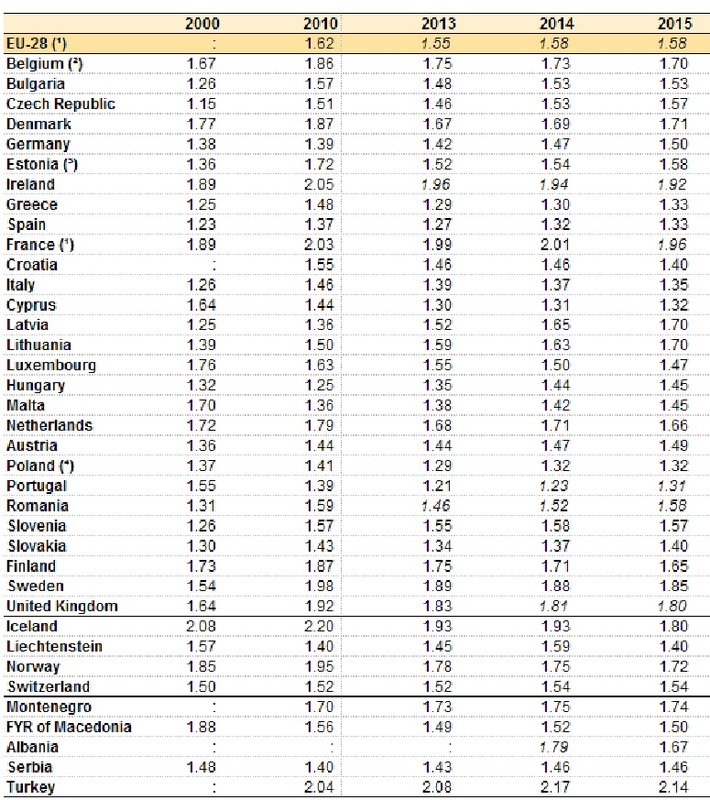 In countries with high infant and child mortality rates, however, the average number of births may need to be much higher.” The European levels of reproduction range from below to well below the required rates to provide sufficient replacement levels (see chart below). For a socialist based economy, low reproductive rates are a death knell, as such governance requires, at a minimum, replacement level reproduction and works best while the population is increasing. As long as there are more workers than retired people and others dependent on government welfare, then the socialist economy is possible, even if not necessarily desirable. The lack of reproduction at replacement levels pressures governments to open the borders for immigration to provide the needed and necessary workers. Problems arise if the immigrants who arrive are unaccustomed to the work ethic at the center of the Judeo-Christian ethics, as they simply add to the welfare rolls and making the economic challenges even greater and possibly far too formidable to overcome. 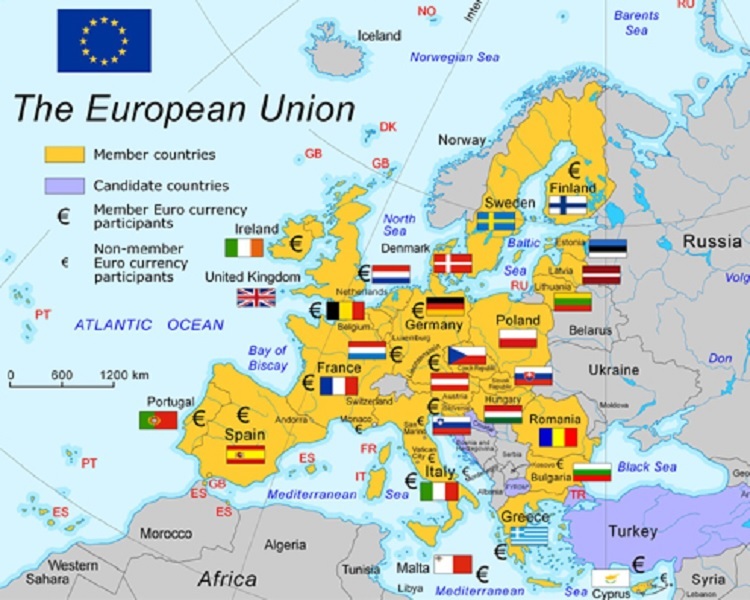 Europe’s sagging economies which are barely, if even, meeting their financial requirements which was part of the reason so many had all but their contractual obligations to support the NATO treaty. President Trump made a demand that the Europeans remember and honor their obligations if they desired remaining in NATO. President Trump, contrary to the claims of his detractors, has gathered advisors who also see the future challenges looming larger and larger on the distant horizons. The winds are blowing in just such a way that unless care is taken, then there may be some very dark clouds troubling the world all too soon. The initial targets may not be as they seem. Iran has lately tested the mettle of the Israelis with a barrage of rockets launched by their Quds Force. The Israeli response was swift and definitive. The response came the next morning from Tehran where Iranian President Hassan Rouhani stated, Iran does not want “new tensions” in the Middle East. Rouhani told German Chancellor Angela Merkel in a telephone call, according to a statement on the website of Iran’s presidency and quoted by AFP and Arutz Sheva, “Iran has always sought to reduce tensions in the region, trying to strengthen security and stability.” What Rouhani did not bother to inform anybody, though he knows the Supreme Leader’s thoughts on the issue, stability in the Middle East to Iran would mean that Iran ruled the entirety and were working towards expanding beyond either into North Africa or across Europe. This is why the basic assumptions of the European Union and the Western European and Scandinavian nations that the Iran treaty is simply all that is required to contain Iranian ambitions. 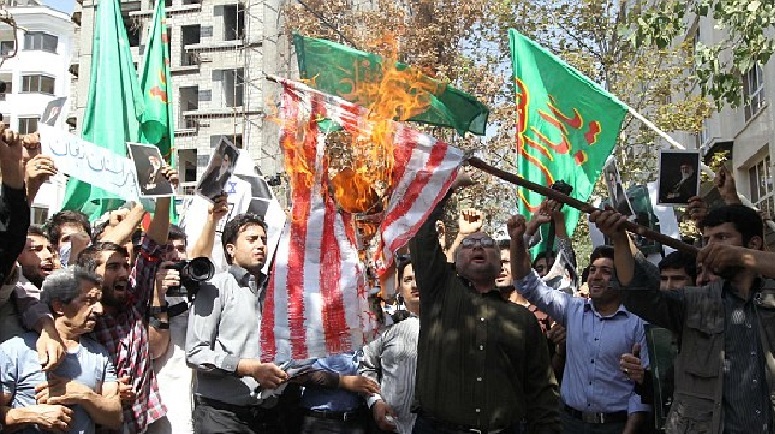 The Europeans simply ignore the broadcasts from Tehran and reports coming from cities across Iran of crowds chanting “Death to America” and “Death to Israel” as simple boasting for internal consumption. They tell themselves that all the bluster is simple nonsense and, after all, such things are of no concern to the Europeans, they are above such things as waring and fighting as their societies have evolved and taken the world into the age of treaties and talking out differences. To the Europeans, nobody would resort to waging wars anymore as World War I and World War II and atomic weapons have made war something obsolete and too awful to even contemplate. Further, the Europeans are so sure of their knowledge of the world that they are betting their lives, their culture, their future and the peace of the world on it. That begs the question, what if they are wrong? From here forward, unless some drastic changes come over what many call Old Europe, the remainder of history will be written without their input and very possibly their consent. The age of Europe leading the world have waned and their light has dimmed. This, at least, is the belief of New Persia, the identity which the leadership of Iran has taken. They believe that Europe is an empty land full of people with no stomach for conflict. They believe they are using Russia bending President Putin to their will in Syria. Here, there is more than a modicum of truth to their reasoning. Russian President Putin has sought to find some means of extracting the Russian forces thus far withdrawing them to protecting their naval bases and their airfield. They are no longer working to combat the enemies of al-Assad, as the Islamic State has become something that forces allied with the United States are mopping up the remainder. There are no longer any threats which Russia needs commit herself to defeating in Syria as the Syria conflict has become an Iranian war. Iran is fighting the Syrian War, the Yemen War, remains of the Iraq War, Sistan-Baluchestan insurgency and some other intra-Iranian conflicts. The coming conflicts will largely come from objectives as set out by the Iranian hunger to gain their hegemony. This is the reality which all too many have chosen to ignore. Those who are not ignoring it, many are simply unprepared to face the reality and unwilling to take the needful steps to make a difference, and, lastly, the few who have seen the coming challenges are being belittled and pecked at by media and left wing subversions. These false fronts crowd the real news off the pages and from the newscasts leaving much of the world’s public completely uninformed. The future conflicts will initially not even be considered worthy of coverage by the media unless they can be spun against Israel or President Trump. This will allow those desiring to commit mischief the freedom to do so all the while moving towards their desired ends. When things reach the fevered pitch making them unavoidable and are thus reported upon, they will claim that everything came out of nowhere and would never have become this way if only the correct people had been elected. This will be the beginning of the next great deception, something we will talk of more in the future. For now, watch Iran, Russia and the Middle East. There will be two other nations of interest which may have much to offer in the future, India and China as they are rising powers who have the luxury of time. Violence in Europe has been steadily rising while media coverage has been consistently retreating in direct proportion. As the violence becomes ever more difficult to avoid the media shields its eyes and ears refusing to notice anything. Making matters worse has been should anybody make statements revealing the rising dangers the media immediately defends their intentional ignorance of the violence and condemns the person for noticing what is right in front of them. The media is on this trail of see no violence, hear no violence and never ever speak about the violence to the point that the political parties who are drawing attentions to the violence and claiming they will fight the rising violence and stem its root cause are derided and ridiculed while the media continues to gush flowingly over the leftist leaders in power who are doing as little as they can get away with while leaving the doors open to allowing even higher and continuing rising levels of violence. During this article we will include pictures which will tell a story in addition to and possibly complimenting the world as we go. Why not start now. Much of the problem has arrived along with the refugees. This is where the problem begins, how to relieve the refugee situations in a humanitarian manner while safeguarding the public and the European way of life. There are Islamists who are utilizing the refugee situation and the goodwill of the European Judeo-Christian ethics which demands that when we see people suffering and in desperate need of help that we open our arms and doors and accept the challenge to assist these people. But are we required to sacrifice our own wellbeing in doing so? There the answer need be no, and not just no, but no in a very big way. 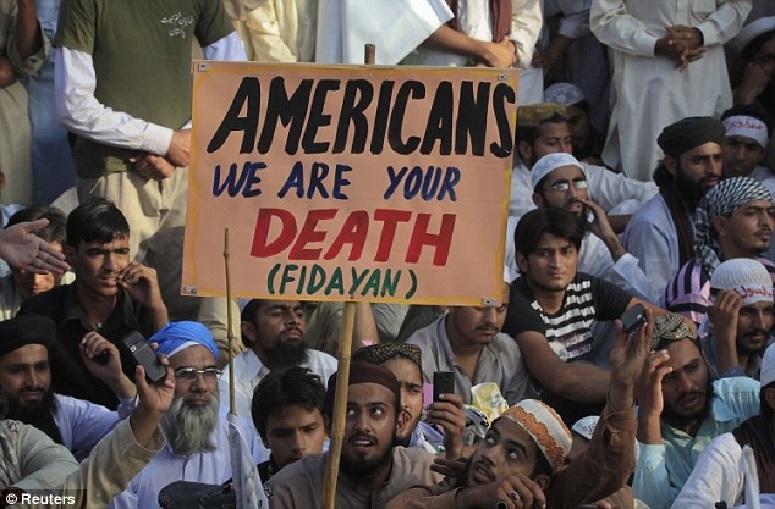 If amongst the refugees there is a core group who are refusing to be thankful for the help we are granting their countrymen and fellow Muslims and instead are threatening our civility and our civilization, then perhaps we need to find a means of weeding out the troublesome ones from the real refugees. Where the left will claim that this would be making the true refugees suffer more hardship, the question must be what hardship will they face were Europe to also collapse and the very Islamists that are currently fleeing take charge in Europe, then where would they be? They would be right back where they started; living in a failed nation with Islamists murdering everybody they believe is not sufficiently subservient to their demands and not following their ideas of Sharia closely enough. When faced with Islamists who refuse to adapt to the European basics for the society and the ways and means of the society and instead are demanding that Europe adjust to their social structure, then there is an impasse which must be addressed and addressed immediately. 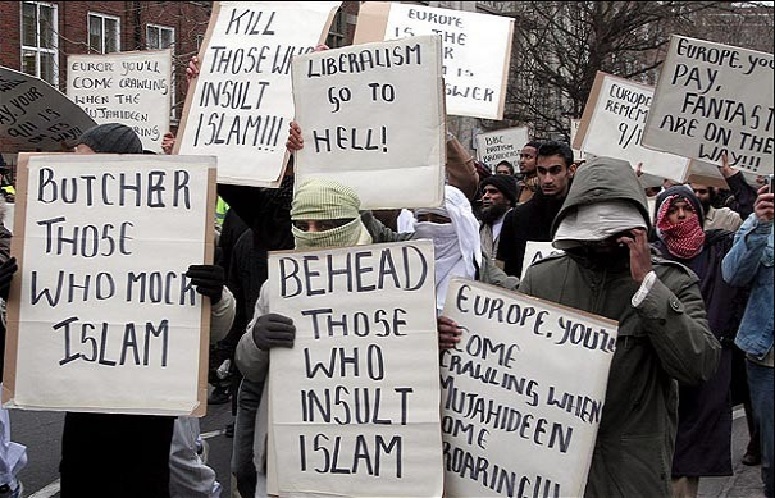 People carry signs as in the picture below are a threat to the very structure and future of the European society. Let us continue. The problem as we view it is that there is an idea that using the emergency whereby there is an influx of refugees into Europe and the United States, until recently and that is still in the courts, that Islamist interests and influences can be placed within these nations and then they can be toppled one-by-one or en-masse through subversion. This was one of the means used by Islam with great success through much of Northern and continuing into Central Africa. They would slowly infiltrate and the first Muslims would preach inclusion, religious freedoms, equal rights and all the ideas and ideals held dear by the existing populations. These concepts could easily be backed with quotations from the Quran from the parts written in the early period which was while Muhammad resided in Mecca and was receiving presumably the verses from the Angel Gabriel who spoke to him while he meditated in a cave outside Mecca. Then, once the Islamic population reaches a certain strength, often around one-fourth of the population, then they would begin to riot and cause distress finally overthrowing the government promising to relieve the people from the horrific conditions of the rioting and other violence. Once in power they enact Sharia and the people can either convert to Islam or live in a state of submission to their Islamic betters, some might call them overlords. There would be laws and taxes imposed on the non-Muslims, the tax is called the Jizya (Arabic: جزية‎‎), which would be increased should additional funds be required to fight a war or to quell any revolts. The non-Muslims would end up paying for their own subjugation. At the point where the game-plan changed and the Muslims took charge, they would then be operating using the Quranic verses written in Medina. While in Medina Muhammad was no longer meditating in the cave nor speaking with the angel Gabriel, he was the commander of a caravan raiding army. These raiders attacked the trade caravans which were headed for the port and trading center in Mecca where riches such as silk and other Asian treasures were traded for the goods from the Middle East and the remains of the Roman Empire as well as the Byzantine Empire which though weakened still ruled from the Greek Isles past Egypt and into Arabia and the Middle East. Muhammad also declared war on the three major Jewish tribes residing in the area. Two were sent into exile after their defeat, but the last was handled differently and many believe this was the start of Muhammad’s period of conquest. This last tribe, the Banu Qurayza (Arabic: بنو قريظة‎‎, Hebrew: בני קוריט’ה‎‎) had all the surviving men of fighting age to the most elderly lined up and beheaded while the children were raised as Muslims and the women were either used as concubines if they were found attractive and the rest were utlized as breeding stock and kept pregnant until they died. For a short article describing the two stages of the Quran and some additional background we have an article titled “Which Quran, Mecca or Medina?” This time apparently the Islamists smell weakness as they are jumping straight to attempting to overthrow the entirety of Europe by swarm and not through slow build-up of their numbers before resorting to violence. So, what might be a solution to the current situation? One direction which could be taken would be to reduce the demand upon Europe and the developed world for taking the extreme numbers of Islamic refugees. Has anybody noticed the absolute dearth of refugees taken in by Saudi Arabia, Kuwait, Oman, United Arab Emirates, Bahrain, Iran, Iraq and the rest of the Muslim world? Perhaps the time has come to demand they take part in addressing this situation and take in some of the refugees alleviating Europe and the United States et al of taking on the brunt of the refugees. The non-Islamic world has taken in their share of refugees from the current situation and perhaps it is time for some of their brothers and sisters, their co-religionists to take their share of the burden. It is not exactly as if Saudi Arabia is cash starved or short of room, especially when compared to Europe. When even Israel has agreed to take in one-hundred Syrian orphans, is it too much to have the richest of the Islamic world to do their part? They should be ashamed that they are doing less than the Israelis are offering to take care of. Additionally, Israel has been treating Syrian casualties with no questions asked. They are brought across the Golan Heights border with each faction having their own designated drop-off point and once the patient can be mobilized and need only minimal additional treatment they are returned to the same drop-point where their faction assumes their care. This may include fighters or civilians as Israel does not want to know nor is Israel told, the Israelis simply are performing humanitarian aid healing those in need of their help and as there are limited hospital facilities left standing and operative, Israel is often the only place to turn. Israel is not advertising nor are they denying this assistance and cannot respond as to who or whether those they treat were injured in the fighting or simply because and are not involved. The one thing that is known is that it has cost the Israeli government many hundreds of millions if not even tens of billions of dollars and nobody has offered to assist defray these costs. Sometimes when doing the right and humane thing one finds themselves very alone in this world, something Israel has become very aware of and continues to be humane no matter the costs. Europe is where this problem has manifested its most serious challenges. The numbers of rapes has risen and is directly traceable to the influx of, as they are referred to by the authorities, “Asians” and the extent of the rise has been kept as if it were a state secret, which perhaps it is. The rioting now has also grown a backlash with anti-refugee demonstrations and the more violent anti-Islam riots. The governments have had no problem labelling these as a xenophobic tragedy of epic proportions. Their claim is that these demonstrations are downright unchristian. It can only be seen as absurd that these leftist politicians who have done everything in their power to destroy Christianity throughout Europe now coat themselves in the cloak of Christianity and take a holier than thou stance on the refugee situation. Still, for the large part the blowback against the refugee situation is more of a reaction to the violence and the Islamists and not the Muslims entirely. The problem is that the truly needy refugees are caught up in the same dragnet which is thrown to catch the Islamist violence situation and they get swept into the same category by association. These Islamists are hurting their own fellow followers of the Prophet Muhammad by their violence in the name of the Prophet. This has tainted all Muslims and further all Arabs even to include the Christians who are now attacked and thrust out by both sides of the issue and yet somehow the leftist politicians make it unanimous as they too fail to grant the Arab Christians the proper protection they require and leave them subject to the violence from all sides. That may be the greatest sadness of the entire situation. 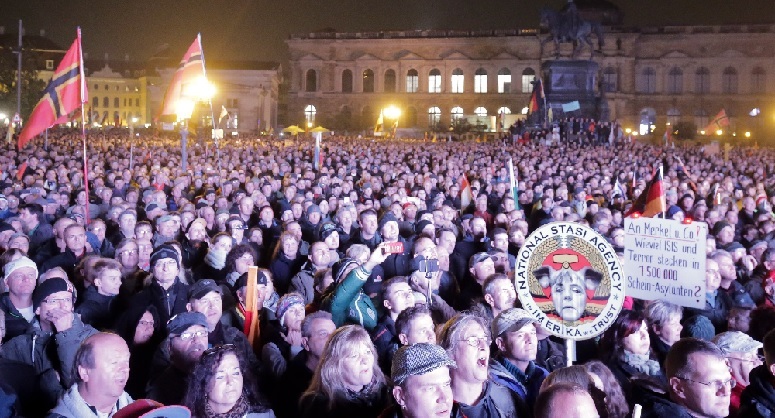 Still, if the European governments do not get people elected in their coming elections in the next four years across the continent and a proper set of conditions and controls put in place, then European governments will indeed fall and the violence coming to the streets will be of tidal proportions. Below is a picture of one of the demonstrations against allowing further refugee immigration from the many across all of Europe. The remainder is where the Islamists will take their fight to spread Islam over the entire world, as they claim they are directed to do by the Quran and the teachings of the Prophet Muhammad. Many Islamists view Europe as already won and well on its way to becoming the new heart of the coming Caliphate. They are less concerned now with forming a Caliphate centered in the nations of the Middle East where there are entrenched Muslim leaders many vying to lead any future Islamic empire and making Europe their new center where the Islamist forces who believe they are getting beyond the cusp in their conquest of Europe and installing themselves as the new rulers in the European continent which they can begin their new Caliphate. They are so assured of their European victory and taking rule over all of Europe making it one great Islamic power replete with a large nuclear arsenal and a ready military that they are declaring their great conquest next on the “to do” list, the United States. Just such a reminder is evidenced in the image below. If you did not finish the longish video above, or even if you have, listen as it tells the plan word for word and believe that they are sure that Sharia is coming to cover the entire world and it will do so in their lifetimes. Believe this as much as they believe it or there will be no preventing such from becoming our reality and in the all too soon eventuality.